Let Go of What You Know – 6 Steps to Meaningful Feedback | Stacey Hanke, Inc.
Are You in Control or Is your PowerPoint Running the Show? Look for everyday opportunities. Feedback is easier to seek and apply in low-risk, daily interactions rather than high-stakes situations. Instead of waiting for the “big gig,” seek feedback on a regular basis. Soliciting feedback involves just a few minutes before and after a conversation, meeting, presentation or even an email. Make it simple. Focus on one behavior at a time. Why just one? First, it is difficult for others to accurately observe multiple areas of communication. Second, if you ask for feedback on multiple items, you risk diluting the feedback, becoming overwhelmed and not taking action on anything. Clarify. Summarize to ensure you correctly heard the feedback you received. How did the feedback differ from your perception of how you communicated? What will you change as a result of the feedback? How did you feel receiving this feedback? Please drop me a note to share the steps you took this month to ensure you are consistent for all interactions or tag me on my Facebook page. 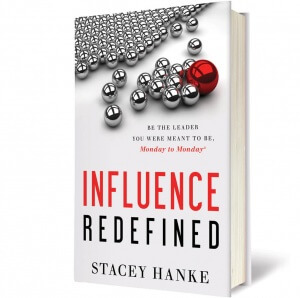 This week’s blog is an excerpt from my new book, Influence Redefined…Be the Leader You Were Meant to Be, Monday to Monday®, available TODAY! I like the 6 steps! I tried this recently with a team member and couldn’t get much past, “I think it’s going well.” Although it’s more positive feedback than I got in the past, I don’t think we have the trust built yet for him to give deeper communication.